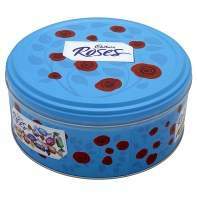 Just finished my weeks shop online and noticed the Tins of chocs at this price. Website states price from the 4th Nov until the 8th Nov. Sorry also limited to 6 per customer. Nice one, my mum bought 2 tins today, I said i'm waiting incase they do 2 for £7 again. Hot from me. anyone confirm this been on website and can't see the offer? Sign into your asda account and book a delivery slot for tomorrow. They will then come up at 2 for £7, instead of the £5 you are seeing, the offer starts tomorrow. Wow great, so glad I didn't cave in and buy them for £5 in Tesco's earlier! Awesome! Hopefully the B&J ice-cream offer is still on too. i assume they have a ok sell by date? Good price, I recently bought two tins for £5 each, should have waited!!! Any idea if this is going to be instore too? In Asda Milton Keynes £5 a tin on Sunday. Will stock up at weekend. You ought to get there before the weekend or they may sell out. i reckon 90% of trolleys will have at least 2 tins tomorrow. these seem to be around all year now on offer and our country is trying to get heathy and stop obesity its not helping at all cheap chocs and a very good price yes but sick of supermarkets almost forcing people to buy them as the price is so good its always too tempting i can stop my self but most people go mad for them and prob end up pigging out on them too there selfs in the end.